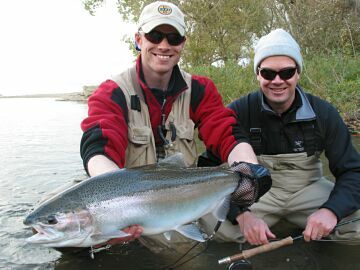 REEL ACTION HOSTS - Paul Jacob and Steve Olufsen hosts for fly fishing travel destinations. Paul Jacob was born to fish. From an early age, Paul knew he was hooked, often skipping school because it interfered with his fishing the fall salmon run or spring steelhead season. Riding his bike, and later, driving his car, Paul lived for his next fishing adventure – what new stream was he going to learn, what new peculiarity of the fish would he find? It is no wonder then, that some years and thousands of stream hours later, Paul found himself the Owner/Operator of Reel Action Fly Fishing (founded 2001), along with partner Steven Olufsen. Guiding for steelhead and brown trout in the tributaries of Lake Erie and Lake Ontario, Paul knows these waters intimately, having spent the better part of fifteen years learning them inside and out. Paul also guides full time in Alaska during the summer months, pursuing everything from monstrous rainbow trout to King salmon on the fly. Alaska is a special place for Paul, as he enjoys the rugged, breathtaking terrain and the incredible diversity of fish and wildlife. Most recently, Paul has traveled to Andros Island in the Bahamas where he has spent untold hours fishing and researching the best fishing lodges and independent guides. An incredible system, Paul has found in the saltwaters surrounding Andros a new fishing playground. A driven, passionate and knowledgeable guide, Paul is also an FFF Certified Fly Casting Instructor, accredited through the L.L. Bean Fly Fishing School. Spending a day with Paul on the water, there is no question as to his obvious love and enthusiasm for the sport, and in fact, clients often find themselves ending the day a more able, educated angler than when they began. Steve Olufsen was born and raised in Rochester, NY and began his days on the waters of Lake Ontario. Steve picked up fly fishing, with his friend Paul Jacob during their many trips to local fishing spots. Living only ten minutes from streams with huge king salmon, steelhead, and brown trout only made his passion fly fishing grow even stronger. Founding Reel Action Fly Fishing in 2001 with long time fishing partner Paul was a natural fit. As an owner/operator, Steve manages the sales and marketing for Reel Action. He enjoys marketing trips and travel destinations by using quality pictures and videos. Steve has been a NYS guide since 2000 and brings over 15 years of fly fishing experience. He has guided the streams and rivers of western New York for salmon, steelhead, rainbows and brown trout. Steve has traveled to Alaska fly fishing for salmon and rainbow trout, and the Bahamas to stalk bonefish on the flats. He holds a degree in Environmental Science specializing in Biology and Geography. Steve has worked on fisheries projects including research on restoring yellow perch populations in Lake Michigan at the Great Lakes WATER Institute.